The surgeon can access the hip joint by different paths, following a "conventional" surgical approach or a Minimally Invasive Surgical approach (MIS). True Minimally Invasive Surgery is characterized by the preservation of muscles and tendons encountered during the surgery to the hip joint capsule and offers a reduced skin incision. AMIS is true Minimally Invasive Surgery. In fact the anterior approach is the only technique which follows inter-muscular and inter-nervous planes to reduce the risk of injury to muscles, tendons, vessels and nerves. Possible muscular release is reduced to a minimum an in most cases is less significant than with other surgical approaches. For this reason AMIS is the ideal approach for atraumatic surgery which is fundamental for a fast recovery: AMIS may improve the quality of your life and help to hasten your recovery after a Total Hip Replacement. The AMIS technique has decreased the incidence of complications when compared to “conventional” techniques. Your doctor will assist in providing more details. In comparison with "conventional" surgical techniques, the AMIS® approach can reduce the post-operative pain as muscles are not cut. Rehabilitation can usually start the day of the operation or the day after, subject to your doctor's approval, based on your post-operative conditions. Standing up and walking with arm crutches may start immediately, with your doctor's authorization as well. The AMIS® technique may significantly reduce the duration of your hospital stay. Your surgeon may still recommend a longer stay depending on your post-operative condition. With AMIS®, the skin incision is often shorter than with “conventional” surgery and therefore scar size is reduced. The AMIS® technique may allow you to return to daily activities in a shorter time frame. 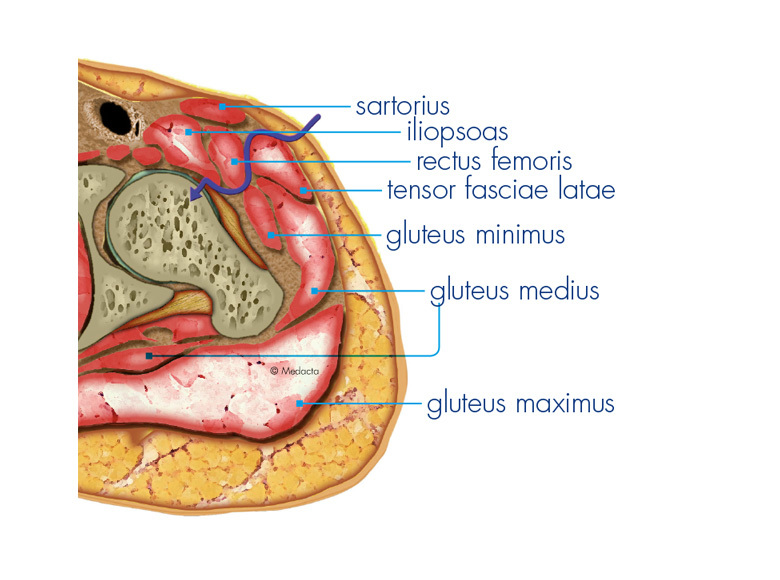 As a result of the AMIS technique the preservation of muscles significantly improves the stability of the hip. The risk of dislocation is minimal and the post-operative limitation of movements, usually prescribed in other techniques, may not be necessary. The risk of dislocation is reduced because the anterior approach is performed from the front of your body and dislocation is mainly related to posterior hip structure damage. AMIS is characterized by a surgical technique that protects the various muscles, blood vessels and nerves encountered during exposure of the hip joint. Minimizing muscle and nerve damage reduces the chances of limping. Because of the AMIS technique, some doctors allow their patients to drive when they are able to get in and out of the car comfortably, have excellent control of their legs and are not taking pain medication. Depending on your general condition and with the approval from a surgeon, some AMIS patients may be driving in 8 -10 days. The primary goal of AMIS Total Hip Replacement is to minimize damage to muscles, blood vessels and nerves surrounding the joint. The AMIS technique is specifically designed to achieve this goal.